Ready for wild adventures with Mordecai and Rigby? Take your favorite blue jay and raccoon with you with this exclusive gift set! Includes a colorful tin tote, plus a 16-ounce travel mug and a set of 4 coasters. All are themed to Cartoon Network's TV series Regular Show! Entertainment Earth Convention Exclusive! Bif Bang Pow! introduces their first item in their Regular Show lineup. Are you ready for more wild adventures with America's favorite park groundskeepers? Mordecai the blue jay and his raccoon friend Rigby star in this exclusive Regular Show Tin Tote Gift Set from Bif Bang Pow!. The colorful metal tin tote box measures 8 5/8-inches wide x 6 3/4-inches tall x 4-inches deep and features the Regular Show logo along with plenty of 4-color artwork from the series on all sides, the top, and bottom. But that's not all. Inside the tote you'll find a 16-ounce travel mug and a set of 4 coasters, all sporting images from the show. "It's anything but" boring and regular! 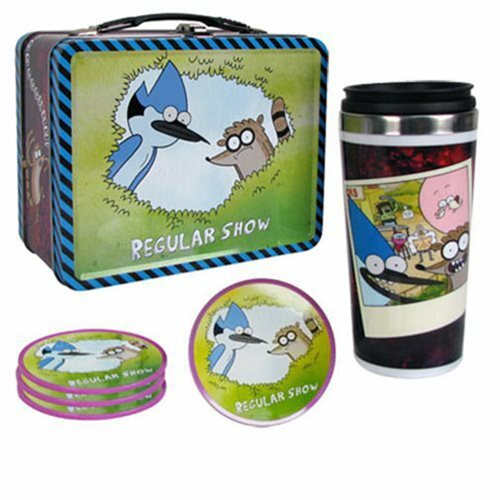 With the Regular Show logo on the back and a highly entertaining image of Mordecai, Rigby, and the others on the front, the 16-ounce travel mug is fashioned of durable plastic and stainless steel. You'll want to take it with you everywhere! BPA free. Hand wash only. Not dishwasher safe. Do not microwave. Thoroughly hand wash before first use. Set your new mug down on one of the 4 coasters included in the gift set! Made of tin with a cork bottom, they feature the show's stars and logo in a multicolored presentation that's sure to grab everyone's attention at your next get-together! Each measures approximately 4 1/4-inches in diameter. Friends and park groundskeepers Mordecai the blue jay and Rigby the raccoon head the cast of Regular Show, an animated television series from Cartoon Network that features the unlikely pair and their often surreal and/or supernatural misadventures.